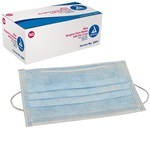 Mask has fluid resistant shield with glass-free filter. Pleated blue mask with flexible nose piece and elastic ear loops. One size fits most. Manufactured by Dynarex. Comes 50 per box. **THIS ITEM IS CURRENTLY ON BACKORDER. 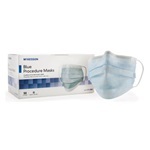 ** Pleated blue Mask has flexible nose piece and elastic ear loops. Fluid resistant. Level 1 barrier. One size fits most. Manufactured by McKesson. Comes 50 per box. Fog Shield mask is made with anti-fog foam to improve vision. 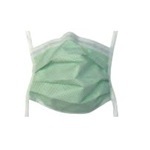 Pleated green diamond surgical mask with fastening ties. One size fits most. Manufactured by Percept Medical Products. Comes 150 per box.